2nd Maintenance Tip: How Old is My Water Heater? If you are like 90% of our customers, a leaking or non-functional water heater is what prompts you to search for a replacement. Customers ask us all the time “how could I have known that this water heater was about to go?” Actually the answer is there if you know where to look. One thing (aside from water pouring all over your home) allows you to easily know when the time has come to replace that water heater: the age of the water heater. If you are like 90% of our customers, a leaking or non-functional water heater is what prompts you to search for a replacement. Customers ask us all the time “how could I have known that this water heater was about to go?” Actually the answer is there if you know where to look. One thing (aside from water pouring all over your home) allows you to easily know when the time has come to replace that water heater: the age of the water heater. Remember that it is not a matter of “if” a tank style water heater will leak, it’s a matter of “when.” A tank heater that is installed in the living room or bedroom closet, over carpet, on third floors, etc should get replaced at the 6-8 year mark, whether or not it is showing signs of aging. Conversely, when a water heater is installed in the garage or otherwise in a location where leakage will cause minimal damage, then it can be kept in use for 10-12 years. Although water heaters can and do last longer than the average life span, a wise homeowner won’t wait for trouble before replacing an aging heater. RHEEM / RUUD / GE water heaters use the MONTH then YEAR format. In our picture below, you will note that the first 4 numbers of the serial number are “0902”, which indicates September (9th month) of 2002. BRADFORD WHITE requires you to use their “decoder” information to determine the age. They use a 20-year letter designation rotation for the year of manufacture. The first letter in the serial number represents the year of manufacture, and the second letter indicates the month. Note that heaters manufactured 20 years apart with have the same first year designation (i.e., A = 1984 and 2004). A=2004, B = 2005, C = 2006, D = 2007, E = 1988, F= 1989, G = 1990, H = 1991, J = 1992, K = 1993, L = 1994, M = 1995, N = 1996, P = 1997, S = 1998, T = 1999, W = 2000, X = 2001, Y = 2002, Z = 2003. A = JAN, B = FEB, C = MAR, D = APR, E = MAY, F = JUNE, G = JULY, H = AUG, J = SEPT, K = OCT, L = NOV, M = DEC. 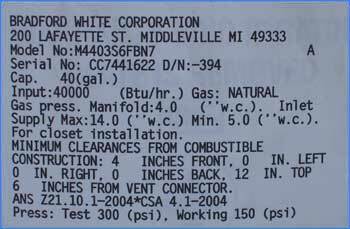 In the picture below, you can see that this Bradford White water heater was manufactured in March of 2006. 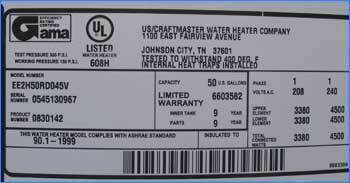 American Water Heater Company markets their line under several names, including Craft Master, Whirlpool, etc. They use a “YEAR / WEEK” format. The first two digits are the year, the second two are for the week of the year. Our picture here shows that this heater was made in the 45th week of 2005.